Adopting an older cat can be a difficult decision for some people. As we have seen so many times, a mature cat can bring great joy to a family home. Bluebell's story is a case in point. She was rehomed from the National Cat Adoption Centre two years ago, and her new family have never looked back. Her story is told her by Michelle and Jim. "Bluebell was 15 years old when we got her. 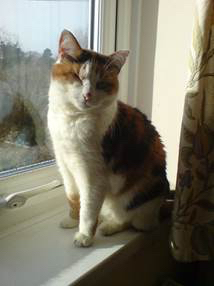 She is a white and tortoiseshell domestic short hair with one eye and, in the words of Cats Protection, she is 'quite a character'. "Well, you sure paired us up with the right cat! When she first came home and we let her out of her carrier she did a 360 degree turn and seemed to nod as if to say 'this will do'. 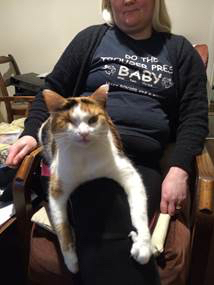 "It was late afternoon and, after some food, she was up on my lap watching TV all evening as if she had always been there, with one paw dangling down the side. "After taking a nap on me, she followed us to bed where she has slept, and has done - mostly on top of me - every night since. "She gets on really well with us both and is so relaxed that we can step over her in the hall carrying the washing basket and she never flinches or moves. She greets us home every time we come in with her tail held high and lots of chat. "I even know what her different calls mean. When she has used the litter tray I am called to empty it at once! "We have daily special cat time together which I can't miss even if I am very busy as I am told by her to come upstairs - which is a good thing as it's good for both of us. Bluebell is a darling cat with perfect house manners. "She has had a couple of medical interventions. She put her hip out, but the vet came out and manipulated it back in and all has been well for over a year since. "She had a cyst above her one good eye, which thankfully was not cancerous and was removed by the vet who also gave her a complete dental check up, x-ray and teeth clean and de-scale. "Her paws and claws were also looked at during this time, so whilst she was 'out' she had a good MOT! Her weight is good, can still completely groom herself, her fur is still thick and shiny and she runs around the house at top speed chattering to herself. "She displays all the signs of a very happy cat, which cheers us no end. 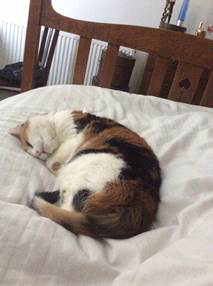 "Once again many thanks for letting us look after Bluebell and give an 'elder' cat her forever home. "She is VERY LOVED and I hope to update you in the years to come, thanking each day that she is healthy and happy."